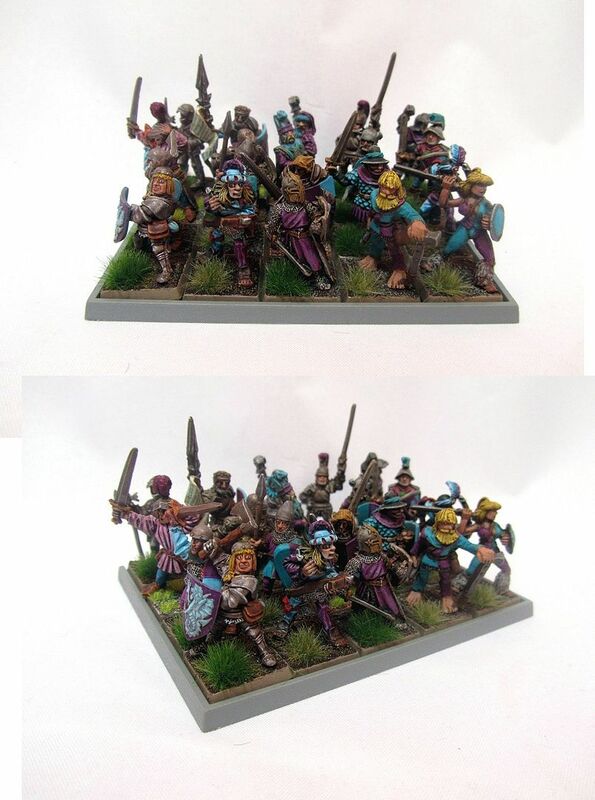 I think they are nice but if that was all you got in your mordheim band there would be little model variety. It would look pretty dull. Having said that the thug in a long coat look they went with in the end wasn't great either. I can see why they were never released though...they're kinda terrible. Totally not up to GW standards, and I'm sure it was just a portfolio test run for a junior sculptor. I got my affordable healthcare. Now I need affordable miniatures. Just give me them all now! I'm stuck with a lovely baby son at the mo, but it's hard work ! 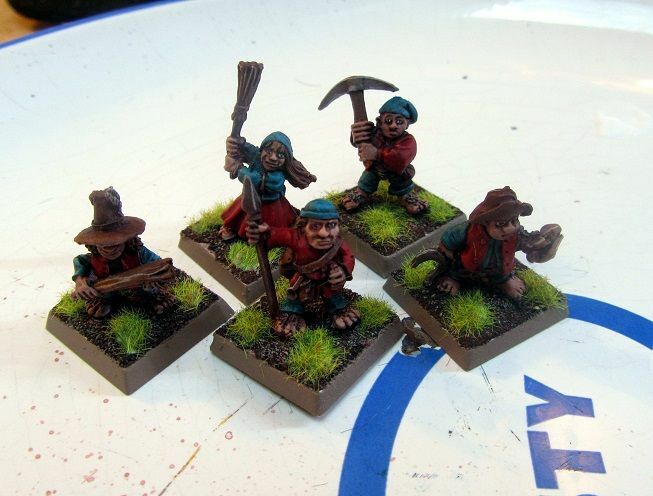 Proper Witch Hunters, so much better than the new finecast noble they made and called a 'witch hunter'. They have a very similar look to Wilhelm, wonder if he was part of the warband and was the only one to make it through. Like Picasso's Blue period, I am having my own Blue and Purple one! They are all 1984/5/7 slotta based GW Fighters C01 range. Some of the rarest are from the less well know compendium additions listing on CCM WIKI. These are arguably the earliest slotta based models GW produced. I have all of these apart from 3.
how are you doing the blue and purple? Am I the only one that sees something wrong with the female figure in the front rank? What's wrong? That she's flashing - sorta - or that you don't like her pose....? I think the "lady" might doth protest too much with the blouse to the navel . . . her codpiece seems well-stuffed. Hey now, that's false advertising! I was expecting a booty shot! I like the gold armor, I don't think I've seen her armor painted gold before. Who is Bertha anyway? 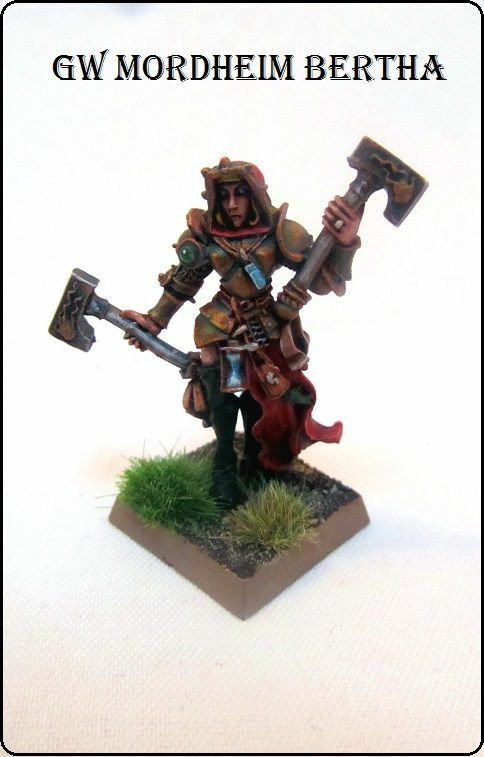 A model from the 'Sisters of Sigmar' warband? She's the head of the Sisters of Sigmar in Mordheim. "High Matriarch" I think is her title. Yeah, sounds about right for a Warhamme-ry religious title. Has any1 got a spare Halfling, the female one with a barrel of ale under her arm? Re: Chumley Warner's Empire Collection - SMall Men !